The REAL beginning of summer. For the last 7 years of my life it has never really felt like summer until my first day at a summer intensive. After 2 summers at San Francisco Ballet School, a summer at Pacific Northwest Ballet School, and a summer at the School of Oregon Ballet Theatre, it just doesn't feel the same without taking class with a bunch of new faces and the sun shining outside. Since joining the company I've always taken at least the technique classes, sometimes jazz, and sometimes taken or taught the men's class at OBT's Summer Intensive. However, those are just a fraction of the classes offered. The level 4 students take: Ballet, Pointe, Choreography, Jazz, Modern, Yoga, Flamenco, Character, Seminar (things like how to eat well, make-up, costuming, lighting, dance history, etc. ), Men's Technique, Partnering, and Weight Training. A typical day goes from 10-6 with a lunch break and a couple smaller breaks in between classes, and you do this 5 times a week (there is just a Technique Class on saturdays), for 5 weeks. So, as you can guess, it's extremely exhausting, but it's also the time when I saw the most improvement both in myself, and in those around me. When all you do all day is focus on ballet, for 5 weeks, how could you not improve? In other news, my summer is going very well so far. I took most of the Adult Intensive last week, which was a nice way to sort of ease back into shape. A friend of Adrian's and mine came to visit for a long weekend; We all met 5 years ago at the PNB summer intensive and have been friends ever since. Other than that I've just been cleaning my apartment, after a month or so of neglect it was in pretty rough shape, and enjoying the weather. I don't start teaching until next week, so I've got 6 more days to relax before I have to do any sort of work again. Level 3A students doing a turning combination. Principal Dancer Anne Mueller teaching Pointe/ Variations to the level 4 women. Hope you're all enjoying your summers! Today we wrapped up the last class of the Adult Intensive for 2008. I was thrilled with the classes this year-- the attitude and commitment of the students is always gratifying, but this year I felt an especially strong and high level of determination to learn in the studio, along with an unusually high amount of skill and aptitude. I think we had fun (I know I did), and I do believe we all connected as individuals working by ourselves yet in a group, pursuing common goals that are also solitary and unique. "In January 2001, James Canfield taught a one-off absolute beginning ballet class for adults. While there had long been various adult classes offered by OBT, this was the first I knew of that allowed people to learn from ground zero. Having long been an avid ballet performance viewer, I realized how little I understood or even noticed of what I saw. A friend who'd been taking ballet classes for years suggested that knowing a bit about doing ballet would make watching performnaces much more enjoyable-- how correct they were. It's now been seven years, and as any dancer realizes, the opportunity to learn in ballet is infinite. I guess that's one of the main attractions for me." "Even after the first few months of class, the insights from ballet class gave me a quantum leap in enjoyument when I watched performances. There really is no comparison to what I see and enjoy in performances and performers now, as compared to pre-ballet class." "First, what I love about doing ballet is the mixture of music and demanding physical work, which is very satisfying to me. Ballet is complex enough to demand my attention at almost every level. There is physical coordination, strength, timing, and a development of very acute self-awareness. I am constantly required to move, then evaluate how close that move came to what it was supposed to be and consider how to adjust my mind, attitude, body and awareness to improve it the next time. At the same time, there is the classical piano music. Working with the music to tune the movement adds a cerebral and expressive component, so there is never dull moment. The class environment is a bit of an escape (from "real life") for me, a place where I can concentrate on many things I love-- movement, music, coordination. Having been physically active all my life, I had never thought of myself as uncoordinated, but ballet class has brought me to a completely different level of coordination. Now, when I do the other things (other physical activities in my life), I have far more awareness of the difference between what I'm trying to achieve and what I manage to do. With that awareness comes the means to adjust and improve in ways previously not possible to me." It's true what John says about the time spent in class as an "escape from real life". For that hour and a half every day almost everything else in our lives and the world outside gets put on the back burner, if only because of the intense concentration that we fall into as soon as that first plie happens. I've often thought class was almost like a meditation. The mind is so busy with the dozens of minute physical adjustments and corrections that are being made every moment, that the outside world can seem very far away and almost startling to come back into. In the studio, we class-takers become like a little team, bonded by individually executing all the same the class exercises, by ourselves, yet together. In any case, I'm wonderfully glad that others can experience that "escape" and feel in their own bodies and minds the satisfaction that comes from working on something so unattainable! Thank you, David and John, for your insight and perspective. With the company on layoff and the school out of session, a new segment of the OBT population has taken its place in the studios this week. The annual Adult Intensive, a two-week series of daily classes for beginning and intermediate adult students, is underway. I believe this is my fourth year teaching classes for the Adult Intensive, and every time I learn more and more about the students, the process, the results, and the satisfaction that comes out of it for all of us. I adore teaching the adult classes, and although I teach one or two of them during the season as a substitute, this opportunity for an unbroken series of classes with dedicated adult students is especially fun for a variety of reasons. For one thing, as the name implies, this is a chance for the adult students to actually study intensively. During the regular school year and company season, adult ballet classes are only offered three times a week due to the shortage of studio space (the entire School of Oregon Ballet Theatre and the company share only two studios--- I still don't know how this is managed). For these two weeks each year while the school and company are off, there are two large studios just wanting to be danced in, so the adult students can immerse themselves in the satisfaction of taking class every day. For me as a teacher, it's wonderful to be able to plan an entire series of classes around some goals for what I think it would be good to achieve for this dedicated group of people, and to actually see the results of ongoing work. I've always had a huge amount of admiration and respect for these students. They come from all walks of life and have varying degrees of experience with ballet and dance. Some have decided to take up ballet study as an adult or come back to it after a signifcant amount of time away, perhaps having studied as a child or teenager but given it up to pursue other things, some are trained in other forms of dance but never tried ballet, and there are always several people who just love watching ballet and want to feel that way of moving in their own bodies. Since I (and most every other professional dancer I know of) started training when I was very young and never stopped, the way I learned about ballet steps and positions was mostly by watching and imitating the teacher. Children have instinctive impulses to move that ballet teachers capitalize on when teaching them how to turn and jump, as well as very pliable young bodies that are relatively easy to form into balletic positions. Adults, on the other hand... we all know how much more everything hurts as you get older! And how much harder it is to summon the energy to move and stretch (watching those little kids bounce off the walls and tear down the street makes me sigh for the days when I had that kind of nuclear energy). So to see so many people make this commitment to learning a new form of movement (and one that is full of unnatural, extreme physical requirements), putting aside other things in their lives to study an art that is not creative but has very specific restrictions, is humbling to me, who has taken for granted all my life how to do these steps and movements. "I had studied ballet all through middle and high school, adding jazz in the last couple of years. After a couple of years away from dance, I took more jazz and a little more ballet through much of my twenties, too. I started taking classes through OBT's adult program five years ago, at the end of James Canfield's last season. Linda Besant, who I knew from the Brown Bag lunches that OBT used to host, saw me looking at a brouchure one evening and dared me to join her in class the next day. So I did, and I've been hooked ever since. The atmosphere of a professional school is part of why I like it at OBT: the teachers are excellent, and we get lots of opportunities to take class from OBT company members, the regular school students are talented and inspiring... there are lots of great things about studying at OBT! Ballet classes give me an artistic outlet for whatever emotion I may be feeling on a particular day, a chance to be expressive in a way that the world outside the studio doesn't really offer. I enjoy the ambiance of a ballet school, which really isn't like any other place. It's also very gratifying to watch dedicated teachers and students strive together to improve, and to get to know other people who understand how dance could be so important to me for so long. As for the rest of my life, I've arranged my work and personal schedules to accomodate four or five classes a week. It takes a little effort, but the physical and psychological benefits are really tangible. There's certainly a "corps" of long-timers and regular class-takers with a lot of shared experience, and I always enjoy seeing them. I also try to be really welcoming of new students, introducing myself before class, chatting with them after class, encouraging them to come back. The adult students, the teachers, regular school students and company members who drop in... everyone loves the program and wants it to thrive, and you can feel that in every class." There are many others like David that I've become happy to see on a regular basis at the studio, taking class, stretching out afterwards, peeking in at company class and rehearsals. I love teaching people who are coming in to class with that kind of impulse and attitude--- regardless of their background or specific reasons for being there, there is a common sensibility of fun with purpose, drive, and commitment to achieve something. We talk a lot about aspects of ballet technique that are harder to explain verbally than they are to do instinctively, which is fabulous for my own understanding of this art form, and I find myself analyzing why things are the way they are a lot more than I do when I'm taking class myself. So it ends up feeling like a learning experience not just for the students, but for my own growth as a teacher and a dancer as well. Next week: Intermediate Adult Intensive 2008! Hello from D.C. ... Still! As I mentioned (I think) I'm staying here with my family until Friday to see the sights of Washington D.C. a little more thoroughly and to relax after a long and successful season. One of my favorite things to do, which I don't get to do too often during the season, is see other companies perform. I feel like it makes me more educated as a dancer both technically (how the steps are executed) and presentationally (the way in which the steps are performed by the dancer). Pilobolus is a group that began in 1971 in a college dance class and has evolved from there into a company that tours both nationally and internationally. What is so unique about them is that they aren't based in any specific dance technique. Their pieces mostly come out of a creative process involving a couple days of sort of playing around and improvising with each other while the choreographer(s) sit in the front of the room and take notes on what they see. Later, they piece the actions together into a sequence and fit it to the music. The dancers involved in the creation process are even given credit in the program as collaborators for that specific piece. *"B'ZYRK", created in 2007, was a good opener, but felt like it dragged on a little bit long towards the end. What began as entertaining clowning around failed to develop into anything more. It was sort of like watching rodeo clowns for 20 minutes... Still, the acrobatics were extremely impressive. *"Pseudopodia", created in 1973, was more along the lines of what I was hoping to see from the company. It was a solo in which the dancer rolled, tumbled, and fell around the stage like an amoeba, never stopping so much as suspending before continuing to ebb and flow around the stage. It was really incredible and I can't even imagine trying to make my body do that. *"Gnomen" was by far my favorite. The piece was made in 1997 for 4 men and was so incredible because they got to be so versatile. Aside from the expected, but still incredible, "manly" rough-housing the final section was a slow movement where 3 of the men lifted and manipulated the fourth man who seems to be asleep or in a trance the entire time. What was so breath-taking is that all of them were so strong, but so gentle at the same time. There was such a sense of comradery, but not in the traditionally masculine way. *"Symbiosis" is a pas de deux from 2001 which was the exactly what the title means, "interaction between two different organisms living in close physical association, especially to the advantage of both"(oxford english dictionary). You can really see they have such a clear understanding of physics and how it relates to body mechanics. Truly amazing. *"Megawatt" was the final piece, and my least favorite. It was made in 2004 to music by Radiohead, Primus, and Squarepusher. In this piece it was most evident they don't have a specific movement vocabulary, and the ballet dancer in me wished they did. It sort of just felt like a choreographed "mosh pit", the energy was great, but the movements felt repetitive and somewhat spastic in a way that was impressive at first, but became sort of assaulting in the end. All in all, it was a wonderful performance in a wonderful venue! After a very successful engagement, it was time to go home. Here's a photo montage of the process it took to get there. In this photo: Lucas styles Anne's hair. Desperate times call for desperate activities. 9:00 PM--We learn in half-hour increments that our flight is slowly fading away. Here we learn that the flight has now been delayed until 11:00 PM. Naps ensue. 1:30 AM--Here Ronnie, Artur, Anne, Grace, Ansa, and Brennan sport their disheveled looks. It's 1:30 and we're in Chicago, waiting for our shuttle to shuttle us to the Sleep Inn. We are expected to report back to the airport for our flight from Chicago to Portland later that morning at about 6:00 AM. 2:00 AM--Hunger strikes. And though we know we will probably feel worse after a visit to McDonald's, we need some remnant of food in our bellies to get us through the night/morning. And we were car-less, so we walked through the drive through. Yuka gently knocked on the window and startled the woman working the drive through. We told her that we'd been on a plane all day and were in need to food, but we didn't have a car. She kindly complied with our request for food. The next morning at 6:00 AM, we all piled into the shuttle again and made our way back to the airport. I thought it kind not to shoot any photos at such and hour. We made our connection, about twelve hours late, but at least we made it! When we saw Mount Rainier, we knew we were on the right side of the country. Finally! In other news regarding our fantastic week, the reviews are in! It's great to be so well received. Thanks for traveling on with us on our first (of hopefully many) tour to the Kennedy Center. Partner Candace Bouchard and I at the end of RUSH after our final performance at the Kennedy Center. After a day of tourism and rest, I was eager to get back in the theater for our final show. From Steven's blog, you saw Studio 4 in which all three companies partook in class. It was a blast to have all that energy in the studio, the energy of new dancers and new teachers. This morning Joffrey Artistic Director Ashley Wheater taught class. It was great to have all three bosses teach a class each performing day this week. It was nice to see the similarities in the way they teach, as they were all at one point dancers in the San Francisco Ballet. After class we had our final performance at the Kennedy Center (for now). It was a great run, and with a few tempo changes from the orchestra, it was great to be back out there on the opera house stage. This was a special performance for Candace and I, as it was our last performance with OBT as members of the corps de ballet. We've both been promoted to soloist for the next season. So it was great to share that on the stage of the Kennedy Center. These are some t-shirts that each company received. After the show I had a celebratory dinner with my parents and a few DC-area friends. 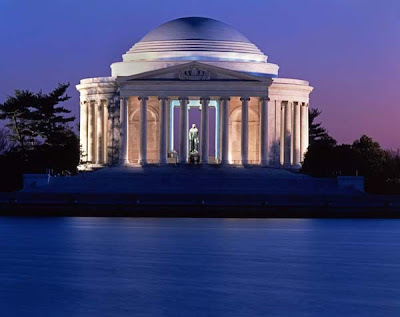 And post-dinner we walked around the Jefferson Memorial, a sight we didn't get to see on our touristic voyage yesterday. It was really beautiful to see it lit up at night. A great final imprint on our fantastic tour to DC. I'm counting down the day that we get to perform at the Center again. It was a great experience for all of us. I'm excited to come back to Portland and share that energy with the rest of the city. I felt such a sense of pride dancing here, and I hope our audience back home feels the same. Thanks for being along for the journey. I'll be back tomorrow with some travel pics when we hop from the east coast back to the west. It will be a long day. So, I told Adrian he could write about today since he got yesterday and had not yet been able to write about a show day. I had some plans but, fair is fair. :-). And, since he'll also be writing about the trip home tomorrow since I will be staying in D.C. until Friday with my family, I thought I would just write a sort of wrap-up reflection on my time here. This has without a doubt been one of the most amazing experiences of my life. I do realize at the age of twenty-two that is quite a statement to make, but I feel fairly certain it won't change. I've met some really incredible people on this trip and seen some truly inspiring dancers and dancing. It gives me such hope for the future of ballet in America. I feel like I have gotten a glimpse of where we are currently and where, as a country, we are going with this art form. Since my last blog was so long I promised myself I would try and keep this short and to the point(e) (sorry everyone for the novel I posted on Saturday, anyone can tell you I loooove to talk). So, I just want to finish by saying a huge "Thank You" to everyone who has helped us in any way to make this trip a reality. Everyone at the Kennedy Center for being so helpful. All the other companies for being so kind and being such amazing artists. The staff of OBT for doing all the behind the scenes work to make this trip run so smoothly. And finally, to all of our fans, old and new, for being so supportive. You are all such a large part of what makes our successes possible. Thank you, thank you, thank you! I'll try to continue to blog throughout the summer. I think I'm going to see Pilobolus perform at Wolf Trap on Tuesday, so that's a blog right there. Take care everyone! A day of rest! Last night was fantastic. It was such a RUSH (get it? ha) to be on stage at the Kennedy Center sharing the stage with the phenomenal Boston and Joffrey Ballets and to make our debut! It was a blast. But after a very long day and a great performance, it was nice to have a day off to play tourist. We had class this morning with the Mikko Nissenen, artistic director of Boston Ballet. One of my favorite parts of this tour is taking classes with the other companies, but also to have class from different directors. And OBT's been fortunate enough to have two collaborations this season, the first being the 4x4 Whitebird Series with San Francisco Ballet, Pacific Northwest Ballet, and the Eugene Ballet Company, and the second being the Ballet Across America festival. Getting to dance with other companies feels like playing, like summer camp for professional dancers. Post class I saw some sights and sounds of the district. My family (including my aunt, grandmother, mother and father) took the Metro train to Arlington Cemetery, and from there got on a tour bus to see the Washington Mall. My favorite stop along the way was the Lincoln Memorial. DC has so much history, and it was nice to hear some of the details behind all of the fantastic buildings. I realized as we were leaving and looking across to the Washington Monument that the Lincoln Memorial was where Martin Luther King Jr. gave his "I Have a Dream" speech. I've always had an affinity for Dr. King, as we share the same birthday (January 15), and because he's a dreamer. I think the Lincoln Memorial holds a peacefulness above the some other monuments. On a final note, my "merde" for Candace, my partner, on our opening night included a JFK quote: "Dream things that never were." I wrote in my note that there were several things I never dreamed of, and dancing at the Kennedy Center was one of them. It appears that Washington DC is place that was built on dreams and ideals, and it's cool to see that reflected in my own life. Final performance tomorrow. It will no doubt be special. Day Three: The Big Show! So, I thought I would start this post with some pictures from my walk to the Kennedy Center from the hotel. This is right outside our front entrance. I love all the old brick buildings in the area we are staying. It's been so sunny since we've been here (except today, it just started raining) and it's been such a nice change from the dreary Oregon weather we've been having. Walking down Virginia Ave. You can just see the Watergate complex in the background. A closer view of the Watergate complex. I had no idea how much stuff there was in the Watergate. There's a Safeway and a CVS plus a multitude of restaurants, offices, and a hotel. Very cool. The Kennedy Center on the left and Watergate on the right. A close-up of the Kennedy Center. I had only been here once before on a school trip and I had completely forgotten how enormous it is. It's such a spectacular facility for both the performers and the audience. There is everything you could ever imagine needing here and everyone has been so kind and efficient. We had class at 10am followed by a quick walk-through of the ballet to refresh our memories of all the notes we were given the day before. After that we had a break for some food and to get into our costumes and do our hair and make-up. We then walked through the ballet on stage with the orchestra (I love live music!!) and then we did a full run. Ilir, Lucas, Matthew, and Brian all sitting in our dressing room. We each have out own individual mirrors with lights that turn on and off independently of the lights around other peoples mirrors. At the Keller you either have all the lights on a bank of mirrors on or off and it can make the room very hot very quickly. My mirror spot. You can see all my make-up and everything organized below and various gifts I've received up on the mirrors. The stuff on the mirror I pack in my make-up case and take with me everywhere I perform. There is a picture of Suzanne Farrell I got from my friend Patrick, the merde gift I received for Vertiginous Thrill from Noah Gelber (the person who set the Vertiginous on us), that's the fake facial hair in the bottom right corner of the mirrro, and the wrapper from a Dove chocolate I had backstage up at PNB during the Celebrate Seattle Festival last season that says "Be Fearless." I always try to keep my mirror spot as organized as possible because I don't want to worry about not finding something right before a show. I always find the more orderly and methodical my preparation for a performance is, the more relaxed and ready for the show I feel. After our dress rehearsal Adrian and I had to go back to the hotel to get our outfits together for the post-performance reception. We then ended up having lunch/dinner with Jon Ulsh in the hotel's restaurant. It's always so interesting to hear about the non-dance aspects of making this company work and really makes me feel like I'm better able to understand how and where I fit into the organization aside from just "soloist." So, after we ate we walked back to the Kennedy Center to get ready for the show. Two great quotes from Kennedy that Adrian and I noticed carved on the side of the building: "This country cannot afford to be materially rich and spiritually poor." And "To further the appreciation of culture among all the people. To increase respect for the creative individual. To widen participation in all the processes and fulfillments of arts - this is one of the fascinating challenges of these days." This was the first quote we spotted and I got goosebumps when I read it. "I look forward to an America which will reward achievement in the arts as we reward achievement in business or statecraft. I look forward to an America which will steadily raise the standards of artistic accomplishment and which will steadily enlarge cultural opportunities for all of our citizens. And I look forward to an America which commands respect throughout the world not only for its strength but for its civilization as well." It's so inspirational to hear that someone who lead our country had such a strong dedication to nurturing the arts. A view of the Opera House where we're performing. It looks big in this picture, but in reality it's a very comfortable size. The incredible chandelier. I spent about five minutes staring at it when I first saw it. This picture doesn't really do it justice, but I don't know that any picture could. Adrian, Ronnie, Brian, Ansa, and Holly warming up for the show. There is only a three minute pause to run on stage and jump around before we start our ballet, so we have to do a lot of warming up and reviewing during the ballet before ours. Having a pause instead of an intermission can be very disorienting because you don't really have a chance to be in the space and get grounded like you do when you have a full twenty minute intermission. A group shot right after the curtain came down on an extremely successful debut performance (Christopher Wheeldon is standing on the far left). It wasn't perfect, but I don't know that any performance every will be. What I do know is we all had a wonderful time performing, and the applause at the end was copious. What more do you really need? I feel so lucky to have shared this adventure with such great people; It truly was the experience of a lifetime. After the show it was time to unwind and enjoy our success. We were invited to a reception hosted by the Dance Critics Association (DCA) and we all had a blast. There was food and drinks and, to my surprise, a large number of our supporters from Oregon. It was so comforting to see some familiar faces and to know that some of our hometown crowd flew all the way across the country to see us made me feel so honored. A big thanks to all of you who came, we all appreciated it so much! Matthew, Lucas, and Linda talking at the reception. 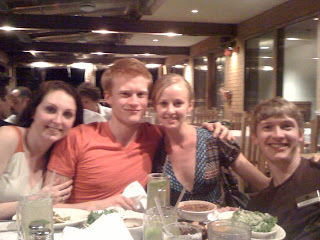 After the reception we were taken to dinner and drinks in George Town by Christopher Stowell and Jon Ulsh. It's so nice to be taken care of after a performance. Sometimes it's very difficult to find food late at night, and even when you know where to find it actually getting there can be somewhat of an ordeal since we're all so exhausted, so it was great to not have to worry about it. Anne, Kent Stowell, and Francia Russell. It was so nice to see Christopher's parents at the show. They are so wonderfully supportive of us and of Christopher that I can't even imagine such an important event going by without them. Candace and Adrian enjoying dinner. Later that night we realized that the fabric on the vanities in all the rooms looked identical to the fabric on our Mother Ginger costume, so we had to get a shot of one of our Mama Gs with it. So, that was my day in a nutshell. All of the rehearsal was extremely tiring, and it felt like the show would never come, but I think we all really came together and gave a wonderful performance that I, my friends/co-workers, and hopefully the audience, will never forget. If all the professional dancers in the United States stood shoulder to shoulder to form a single chorus line, it would stretch from 42nd Street for nearly the entire length of Manhattan. If every artist in America’s work force banded together, their ranks would be double the size of the United States Army. More Americans identify their primary occupation as artist than as lawyer, doctor, police officer or farm worker. Our second day on tour in DC involved more dancing and less sitting on planes, which we all prefer. After a looong day of traveling from coast to coast, it was nice to arrive in the heat and humidity! Portland has been exceptionally dreary lately, and it's nice for bodies to dance in a warm climate. My warm up for the day consisted of walking from our hotel to the theater. It was great. The Kennedy Center is truly monumental. It's a fantastic structure and venue, and I'm amazed that we are performing here. Here is my first shot of the theater, and my first taste of the magnitude of the building. At ten o'clock we donned our RUSH costumes and spaced the ballet on the stage of the opera house. We hadn't yet had our class, so it felt a little foreign to be putting on a costume before we'd even done a plie for the day. We were grateful for this time though, because it gave us a feel for the new space. In Portland, we performed RUSH at the Schnitzer Concert Hall, and the Kennedy Center is maybe twice as deep as the Schnitz is. In this photo: Maestro Niel DePonte, Christopher Stowell, Christopher Wheeldon and Anne Mueller lead the rehearsal in Studio #4. After we spaced the ballet we had a lunch break and then returned to Studio #4 in the Kennedy Center to have class and rehearse with Christopher Wheeldon. Lining all of the walls leading up to the Studio were posters from companies that had previous engagements at the Kennedy Center: American Ballet Theatre, New York City Ballet, Bolshoi Ballet, Fonteyn & Nureyev, Kirov Ballet, Joffrey Ballet, Feld Ballet, Pacific Northwest Ballet. I wanted to post an OBT poster up there with them. It's fantastic to be around all of this history, but better yet to be a part of the history. Here Wheeldon works with Yuka Iino as Christopher Stowell looks on. At the end of the evening Steven and I headed back to the Center to see Pacific Northwest Ballet, Kansas City Ballet and The Washington Ballet perform their series of Ballet Across America. We were surprised and proud to see OBT's own Alison Roper and Artur Sultanov gracing the cover of the Playbill for the entire run of Ballet Across America at the Kennedy Center. Again, another part of being history. Pacific Northwest Ballet performed Nacho Duato's Jardi Tancat magnificently. It's a work I've seen before, and watched it often in my year at PNB. I am less familiar with Kansas City Ballet. I saw their Nutcracker years ago, but some of the names are still familiar. They performed Todd Bolender's The Still Point, a work that was created on Melissa Hayden, one of Matthew Pippin's former teachers. It is a deep work with some beautiful moments. And finally, Washington Ballet performed Twyla Tharp's Nine Sinatra Songs, a work that I also became familiar with in my year at PNB. The costumes were designed by Oscar de la Renta and they look fantastic in the work. I loved some of the partnering maneuvers. The company is a hometown favorite, and I believe they perform at the Center often. Standouts were Sona Kharatian, Morgann Rose, and the couple in black (my program has disappeared currently). Tomorrow we have our dress rehearsal with Boston Ballet and Joffrey Ballet, and tomorrow evening we open. It's been a fantastic two days and I can't wait what else there is in store. 6:40 am: Arrive at the airport and wait to board our 8:40 am flight. Coffee was a necessity. The wonderful people at Lulu Lemon sent us a card. So sweet! During our layover Ansa and Grace made some new friends. 8 pm (ish): Arrive in D.C. and collect our Luggage (that's the fastest I've ever gotten my bags!). We had a bit of a shuttle debacle which involved us waiting in one spot, then going to another spot, then going back to our original waiting place... So Fry and I decided to take pictures of each other taking pictures of each other. Can you tell we were bored? :-). Yuka and Ansa striking a pose. 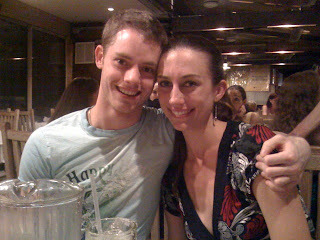 That night Adrian, Brennan, and I got Mexican food with Brennan's friends Stephanie and Brittney and Adrian's friend Katie (all from Ballet West). Sorry this blog was so late, but my room isn't wired for internet so I had to wait until I had time to run to the lobby! Now I'm off to see PNB, Washington Ballet, and Kansas City Ballet perform. I think Adrian will post a blog later about today!